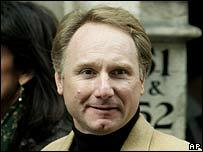 One of the authors claiming Dan Brown's bestseller The Da Vinci Code copied his ideas has admitted he exaggerated his case in an interview with a journalist. Michael Baigent had said 15 points central to the plot of Mr Brown's novel were from a 1982 non-fiction book Mr Baigent wrote with two other authors. As the case resumed at the High Court in London, however, Mr Baigent said his language had been "infelicitous". He and co-author Richard Leigh are suing UK publisher Random House. They have taken the publisher to court for copyright infringement. Mr Brown is expected to take the stand later this week. Mr Baigent and Mr Leigh claim Mr Brown "relied heavily" on their work, The Holy Blood and the Holy Grail. The book's third author, Henry Lincoln, is not involved in the case. Random House, which published both books, has denied the allegation. The case resumed on Tuesday after a week-long break to give the judge time to read both books involved and related materials. Mr Baigent was first to take the stand, where he was asked about an interview in which he claimed 15 points central to The Da Vinci Code had been taken from The Holy Blood and the Holy Grail. James Baldwin, a lawyer representing Random House, said this claim was "simply false" and that seven of the cited points did not appear in Mr Brown's book. "In that case you are correct," said Mr Baigent after a pause. " I think my language was infelicitous and I think I have to agree with you on that." The Holy Blood and the Holy Grail is referred to directly in The Da Vinci Code, which features a character whose name - Sir Leigh Teabing - is an anagram of Leigh and Baigent. Mr Baigent said Mr Brown stole "the whole architecture" of research that went into their book while writing The Da Vinci Code. Both books contain the idea Jesus had a child. 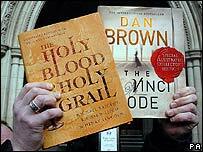 Random House, however, claim Mr Brown used several sources for his research and had written a synopsis of The Da Vinci Code before he had even looked at The Holy Blood and the Holy Grail.